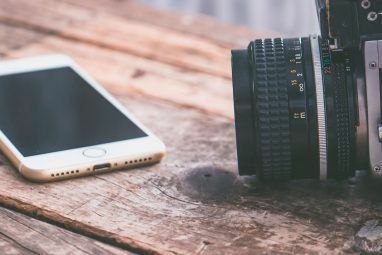 Taking a self-portrait with your iPhone or other camera-supported iOS device is probably one of the easiest ways to capture yourself in a photo. Tap the little camera icon in the upper-right side of the camera screen (to activate the front-facing camera), and you’re ready to snap a selfie. For a smartphone, the iOS camera is actually very good and powerful out-performing many point-and-shoot cameras. 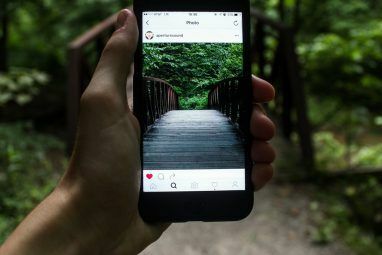 But if you want to get a bit more creative taking self-portraits with your iOS camera device, there are a few very fun and useful third-party apps, costing no more than a couple of bucks, that enhance your self-portraits. There are apps featuring artistic filters, self-timers, and various ways to export and share your photos right from within the apps. Best of all, you can take as many self-portraits as you like, and not spend a penny extra doing so. But before I start my review of useful apps, let me share one little tip when it comes to taking self-portraits with an iOS device. 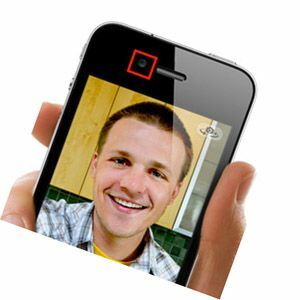 When you take a self-portrait, though your face appears in the screen, you might want to look straight at the screen itself or at the lens located on the upper-left side of the device. Otherwise, your eyes may appear to be looking down into the screen or off on some other direction. For the straightforward, in-your-face self-portrait app, Everyday ($1.99) just might be the ticket. Everyday is for the purpose of snapping a photo of yourself everyday for as long as you can, and then running those selfie pictures as a slideshow or movie, to see all the nuanced changes that occur as you grow older in months and years. Everyday has a built-in reminder to snap your self-portrait. The app contains a feature for lining up your face with an adjustable grid or use an overlay of the last self-portrait you took. Shooting yourself this way is what allows you to capture those small changes overtime. Everyday is not the most creative way to do self-portrait, but it would be especially interesting for say a 13 year-old to use for a year and notice some real changes. You can also of course share your photos via Facebook, Flickr, Twitter, and Tumblr from within the app. IncrediBooth ($0.99) has the look and feel of those carnival photo booths in which you take photos with your significant other or friends. The app is very easy to use for both self-portraits and shots of other people. To snap a series of four photos, you simply tap the nice size red button to activate the shutter. Between each photo shot you change the expression on your face. IncrediBooth is a fun app for getting yourself and other people involved. It includes four different filters (Alfie K, Johnny S, BlackKeys SG, and Betsy X) which you change and select by turning the dial around the red button. Additional IncrediBooth filters have to be purchased for $0.99. QuadCamera ($1.99) is another multi-shot camera with a lot more features than IncrediBooth. QuadCamera can take 4-8 serial shots and put them together in one image. You can adjust the timer for the number of seconds (1-3) between each shot, as well as select six different color modes, including Vivid, Dull, Greyscale, Bright, Hi-Con and No Effect. The layout for shots can also vary from 2×2, 4×1, 8×1, with resolution sizes of 800×600 or 1699×1200. Each photo collage is saved to your Camera Roll and from there exported to Twitter. If you would like to become a part of a community of self-portrait photographers, download the free Emotish app. While you can certainly share your selfies on any photo sharing site, Emotish has a unique concept. When you post a self-portrait to your Emotish timeline, you tag it with a word that expresses how you’re feeling or what you think your photo conveys at the time – for example, “bad hair day”, “blissful”, “brave”, “camera shy”, “conked”, “creepy”, “distracted”. The app links to the iPhone’s camera so you can take a self-portrait right from within the iPhone app, or grab an existing selfie from your Camera Roll. 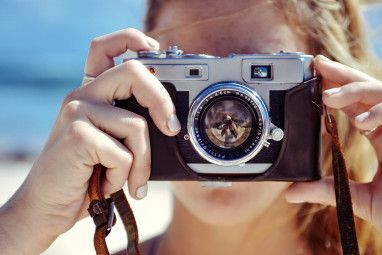 In addition to posting your photo, you browse and favor other self-portraits, as well as post your photos to Facebook and Twitter. For a little lightweight self-portrait fun, you might consider downloading the free version of ToMoTo – an app that adds a bit of artistic flair to your photos. ToMoTo includes a face-diction feature that automatically lines up different types of drawings, including glasses, whiskers, hats, earrings, etc., to your face. It will even recognize more than one face in a lens. The biggest drawback to this camera app, however, is that you can’t preview the results within the app itself. You have to open your Camera Roll and see them there. Nevertheless, if you find the app sort of fun, you might invest in the full version for $2.99. Let us know what you think of these apps. And feel free to share your favorite self-portrait camera program. Explore more about: iPhoneography, Photography. Sounds like you want to step up to the iPhone 4 or 4S?